Written on February 24, 2013 at 11:09 am by Air Coole VW Love! The critter turned out to be a 1974 Super Beetle with some bad engine troubles along with a lot of other ails and pains. I had gotten my hands into grease and oil of necessity ever since I began driving up and down the roads and even as a passenger at times. 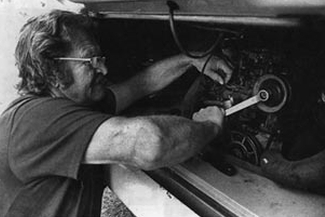 With them old cars, especially the “fixer uppers” and project cars, there’s always something that needs fixed or replaced. I didn’t have a compression gauge so I removed the plugs, one at a time, and shoved a napkin into the hole while he turned the key. I found two cylinders which lacked sufficient compression to even blow the napkins out of the hole. I was really thinking that the most significant thing this car needed was a new set of rings and some TLC. We started up the car again and I took it for a ride. The ole green bug would take you down the road but it didn’t have much “juice”. Still I felt a connection and I was confident that I could get it to running with not too much trouble. I decided to try to make a deal for it and I ended up trading the truck even. He was happy to have a pickup truck and I was happy to have a Beetle. As I was trekking to get the car to the house I had to stop a few times. Luckily I never had to stop while going up any hills. On some of the bigger ones I had to gear down to first and the “movement” was barely registering on the speedometer! I did manage to drive it home OK. I parked it and started making plans for new rings among some other things. It wasn’t too long until I got my first speeding ticket. I was in that 74 Super Beetle after some work had been done. Overall I put less than two hundred in it and a lot of sweat and tears. I was hitting 75 and 80 with no strain at all. All these years later I miss the car. I wonder where that old 74 Super Beetle ended up. Somewhere along the way I ran into a VW fan, you tend to meet a lot of them when you own an old bug I reckon, anyway, this guy gave me a battered old copy of How To Keep Your Volkswagen Alive, the “Idiots Manual” by John Muir. I loved that book! Over the years I have given my copy of the Idiots Manual to another VW enthusiast numerous times. I buy another copy as soon as I get the chance. Sometimes I might find one at a yard sale or a flea market and get an extra copy. Eventually, I would run into another soul that really needed that book and I would give it to them. Now, here I am publishing a blog about the coolest “hobby” I have ever had. I have affiliate links to amazon.com. If you use one of my links to purchase the book from Amazon I get a small commission. You still get the same price and Amazon.com takes care of the orders and fulfillment. I truly appreciate those who would take the time to use these links to get this great book (or any other product from Amazon). Over the long years between that green Super Beetle until now I have owned several Bugs, a square back, and a bus. Today I have a 1967 convertible Bug that is a project car. I have owned it a little over a year and have never even attempted to start it. That is a project for the nice spring weather not too far off. Also, today, I have a copy of the John Muir book How To Keep Your Volkswagen Alive – this one is the 19th edition. I don’t know how many copies I have had but its been quite a few over the decades rolling by. I do love the book and how it is written and illustrated. Its actually fun to read it and you will have to laugh out loud sometimes at the way its put together. 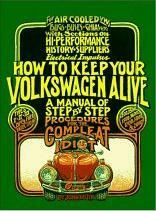 The humor and “laid back” atmosphere of the book aside it is full of great tips and step by step instructions on how to keep that VW alive and well. I also have several Haynes manuals, and a few Bentley manuals. I highly recommend the Bentley manual for anyone who will be working on and/or maintaining one of these air cooled beauties. 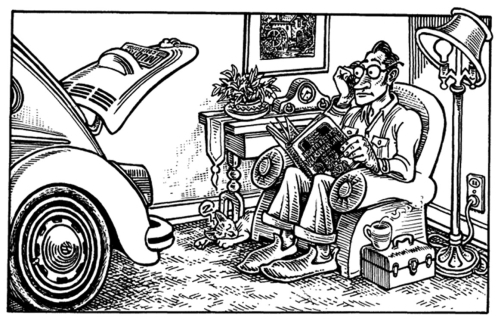 Its been awhile since I’ve sat down to write something for the Air Cooled VW Love website. I just felt like reminiscing about the old days and didn’t really know where the “article” was headed. I really wish that I could have had the opportunity to meet John Muir, he is one of my few heroes. Since I am on the subject of books here I would like to mention Wolfsburg West. They produce a catalog that is a treasure trove of info about interchangeable parts and what goes in what model. Even if you never order anything from them their catalog is a real asset to have. When I ordered mine there was a $4.00 charge with free shipping. I feel that it was well worth it. edited 01/16/2018) This past Christmas I passed on my copy of the Idiot’s Manual to my grandson. Once again I am without a copy. But it is worse than that. I do not own a Volkswagen, air cooled or otherwise. 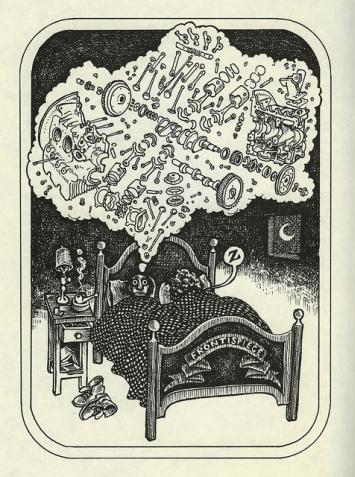 John Muir was a genius read velvet monkey wrench and see for his simple fix to the planet! Thank you for saying that James I do appreciate it. I love these old VWs and have spent many a mile with one. I even lived in a VW bus for a year or so. A great story. I am a big lover of air cooled volkswagens too. Owned a few in the past and always wanting to get another!